If your order weighs less than 13 ounces, save huge on shipping with USPS first class (with tracking number). This product weighs 8.7 oz. 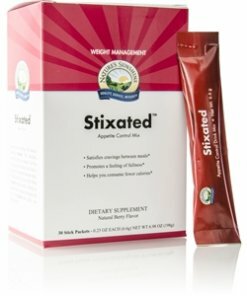 Nature’s Sunshine Stixated works by helping to curb your appetite during the day between meals. 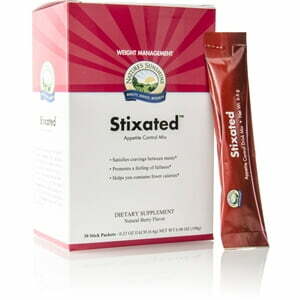 Stixated accomplishes this with two key ingredients: garcinia cambogia and chromium picolinate. As a result, you consume fewer calories, which in turns leads to weight loss without associated hunger cravings. Instructions: Packaged for convenience, Stixated stick packs are easy to take along and use anywhere. Simply pour the contents of one packet into 16 ounces of water and stir. Consume one packet or more daily between meals when you feel hungry. This small fruit from southeast Asia has a long history of use for various health conditions. We use an extract that is pure and standardized to 60% of the active ingredient, hydroxycitric acid (HCA), which may promote the feeling of fullness between meals, helping you avoid unnecessary snacking. This mineral found in trace amounts in grains in vegetables helps activate insulin, the key hormone that helps your body convert blood sugar into energy rather than fat. Chromium is used in many health supplements because of studies showing its effectiveness with supporting already-normal blood sugar levels and it also may help with food cravings. Each pack contains 3 grams of fructo-oligosaccharides (FOS), a short-chain soluble fiber. Fiber has been shown in studies to help the stomach feel full, leading to the consumption of smaller portions. This particular fiber is also a prebiotic, a food for healthy probiotics (beneficial bacteria).